All Photos and Text copyrighted by Dr. Phillip C. Lucas, 2000-2019 unless otherwise noted. The archaeological site of Penas de los Gitanos features evidence of human settlement from Neolithic times to the Bronze Age. It can be found in a remote area on private property 7 miles east of the village of Montefrio, near Grenada, Spain. There is a sign post off the road to Illora. Excavations at the site have unearthed numerous artifacts including combs made from bone, flint arrowheads and shards of decorative ceramics. There are at least 7 dolmens. Dolmen 23 is oriented to 120 degrees, possibly sunrise on Winter Solstice. 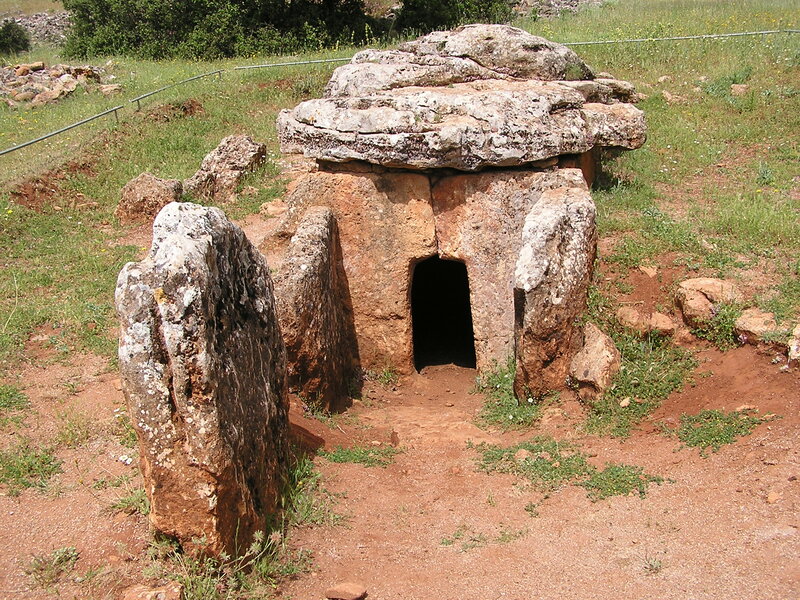 Several of the other dolmens at the site are similarly oriented. The massive capstone is split in two. The interior left jam has a whorl-like pattern incised on it. The view from the entrance looks off to a notch on a far distant ridge across the valley. In one nearby cave dwelling, primitive rock paintings can be found. Elevation at this dolmen is 3394 feet. 37°N20.238′ lat., 30°W57.720′ long.